Rollin' down the river with Proud Mary and her krazy krewe! : Snuggly! 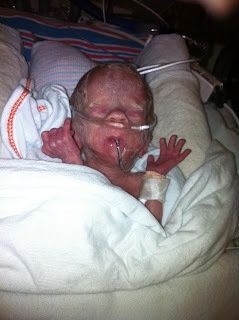 Today when we visited Liam we declined to do any kangaroo care since he didn't tolerate it too well yesterday. So instead we just touched him through his isolette. He was SO snugly, don't you agree? I love how the nurses can make him look so comfy in his bed. The nurses have been so great so far that I feel so confident when I leave him that all is OK, it's so comforting.